All portions of the fuselage within 10" of the engine mounts and canard and wing. All flying surfaces in the shaded areas shown plus all overlaps at L.E. & T.E. 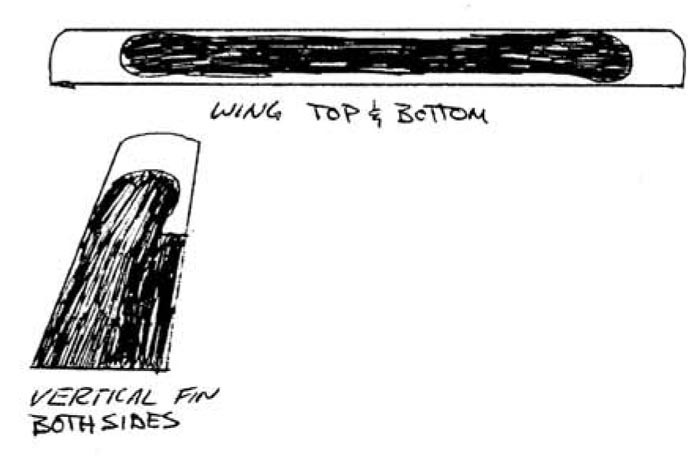 Major wrinkles or bumps along more than 2” of chord are cause for rejection in the wings, canard and winglette, particulsrly on the top (compression side) This does not mean you have to reject the whole wing - anything can be repaired by following the basic rule: remove the rejected or damaged area and fair back the area at a slope of 1” per ply with a sanding block in all directions. By watching the grain you will be able to count the plies while sanding. Be sure the surface is completely dull and layup the same plies as you removed, plus one more ply of BID over the entire patch. This will restore full strength to the removed area. 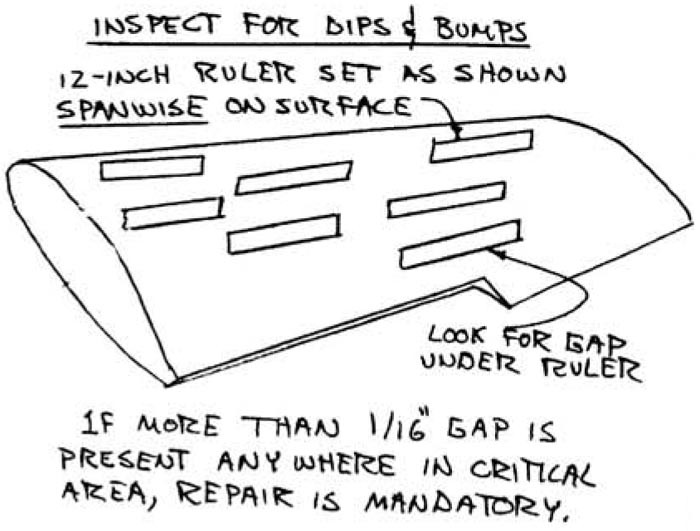 Use this method to repair any area damaged for any reason - inadvertent sanding through plies during finishing, taxiing a wing into a hanger, etc. A variety of structural corners are employed in the construction. 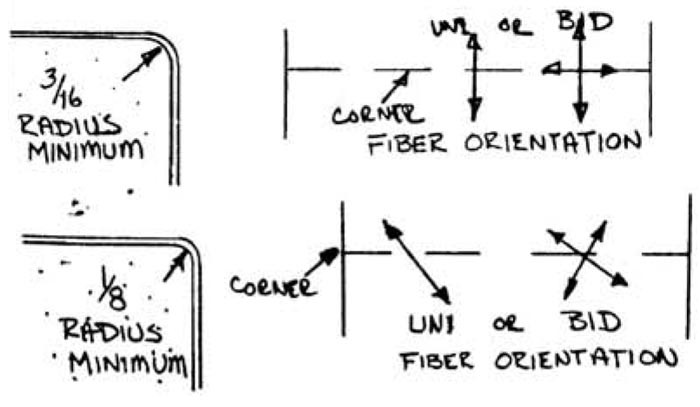 There are two basic types of corners one where the glass fibers are continuous around the corner, and the other where a structural filler ss used and gless is bonded to the filler. The corner with the glass fibers running completely around it is used where maximum strength is required. 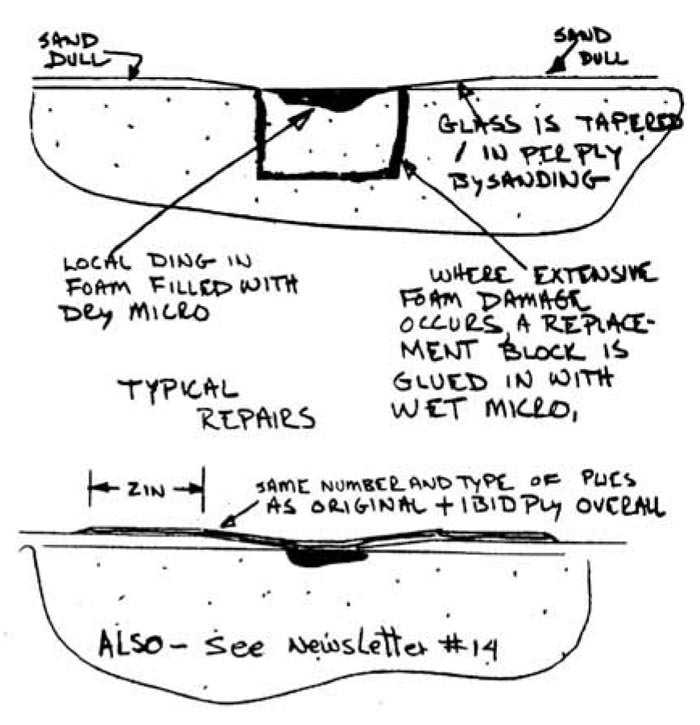 Inside corners can be laid up quite abrupt and only a very slight wipe of dry micro is needed to get the glass to lay into it. BID cut at 45° is used on this type of corner. Outside corners require a radiused edge. 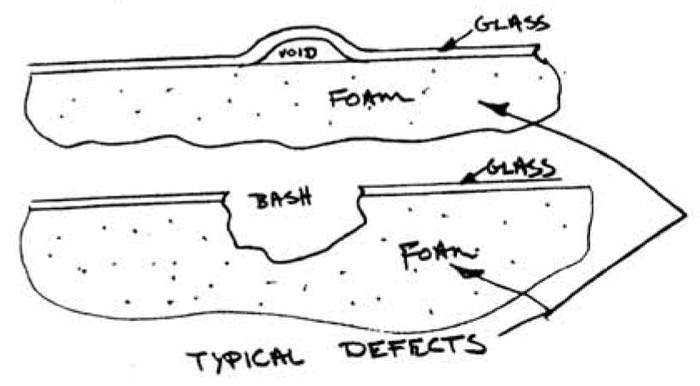 Where the glass fibers run directly around the corner a minimum radius of 3/16 inch is required. Where the fibers run at an angle to the radius, only a 1/8-inch radius is needed. In some areas a sharp corner is desirable and maximum strength isn’t required. In these areas a flox corner is used. A simple unsupported glass corner has very poor strength. To strengthen this corner a triangle of flox is used to bond the glass plies together. The flox corner is done just before one glass surface is applied for a wet bond to one surface. The other glass surface has to be sanded dull in preparation as shown.